The sherd of the rare oil lamp depicting a menorah. Credit: Anat Rasiuk/Israel Antiquities Authority. 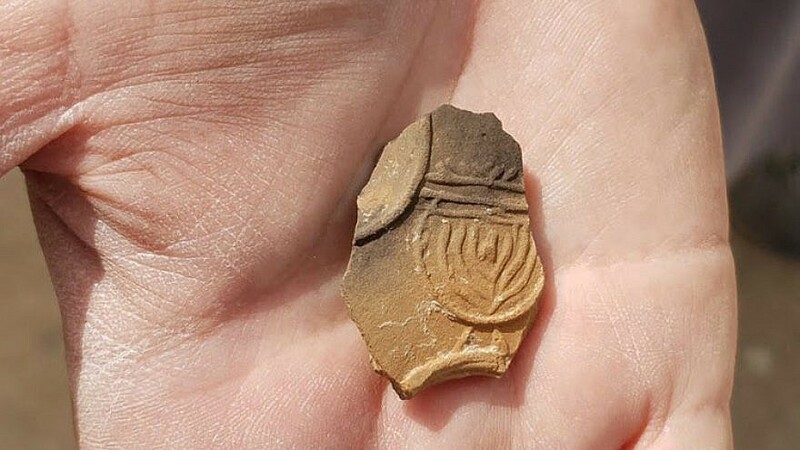 (April 4, 2019 / JNS) The remains of a Jewish settlement of the Second Temple period, including the sherd of a rare oil lamp depicting a menorah with nine branches, have been discovered in Beersheva for the first time, revealing proof of Jewish day-to-day life there, announced the Israel Antiquities Authority on Thursday. Along with the menorah, limestone vessels used by Jews for reasons of ritual purity and a watchtower were uncovered. The site is located along the southern border of the ancient kingdom of Judah next to a road that led from Tel Beersheva to the southern coastal plain. Finally, dozens of bronze coins discovered at the site belong to the period of Roman provincial rule. Some were minted in Ashkelon and others were minted in cities from throughout the Roman Empire.